freshly ground black pepper to taste – pinch. Preheat oven to 2000C and lightly grease and oven tray. 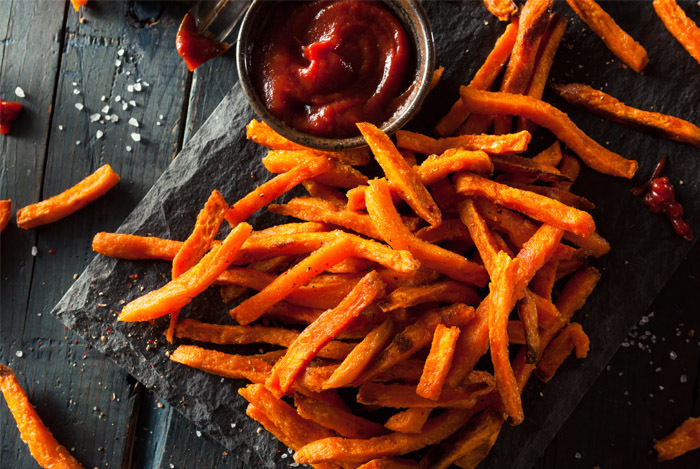 Place the sweet potato in a steamer basket over a saucepan of boiling water and steam for 10 minutes. Meanwhile, mix together the almond meal, herbs, lemon and some salt and pepper to taste. Drizzle in 1 tsp olive oil and mix well. Brush the fish with a little egg and coat with the almond mix. Once the sweet potato has been cooking for 12 minutes, turn them over, place the fish alongside, and bake for a further 12 minutes, or until the fish is cooked through and the fries are tender. Serve immediately with a green salad or steamed veggies. If you want to serve more than one, adjust the quantities accordingly. Instead of baking the fish you could lightly fry it in some coconut oil for 2-4 minutes each side, or until the fish is cooked through.